You are here: Home / News / Law Enforcement / Will 2015 Be The Year Wailuku Town Gets Parking Meters? 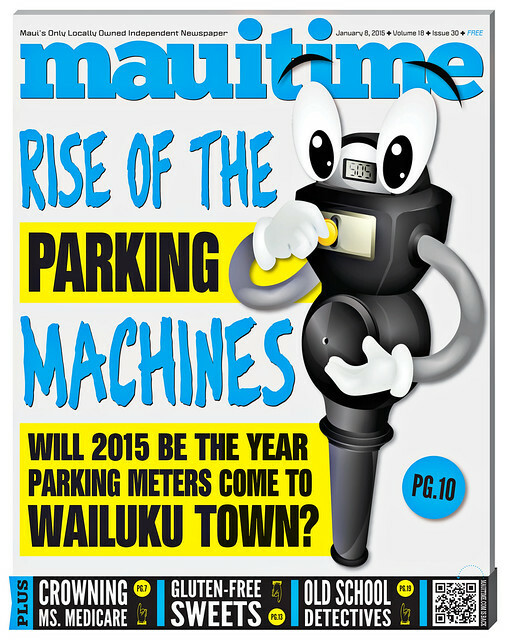 Will 2015 Be The Year Wailuku Town Gets Parking Meters? When the great history of Maui in the 21st century is written, the year 2015 will go down as the beginning of the Post-Taguma era. Residents–especially those who live and work in Wailuku Town–have been celebrating the retirement of Maui Police Officer Keith Taguma for weeks now. Each year for the past three decades, Taguma’s inhuman work ethic and singular dedication to writing parking tickets–something like 7,000 a year, on average, which was more than any PD district–struck terror into our collective hearts. Celebrate while you can people, because the Law of Unintended Consequences will soon play havoc with Maui. Nature abhors a vacuum, Aristotle said, and the world of parking logistics is no different. As it stands now, parking in Wailuku–if you can find it–is free. There are no meters or even pay lots. But for the last few months, the Maui Redevelopment Agency (MRA) has been working on changing all that. Taguma’s exit lays bare Wailuku’s dirty little secret on parking: for decades now, the town’s great plan to deal with parking was called Keith Taguma. He rode out into town nearly every workday, first on his little golf-cart like Interceptor and later aboard his Harley Davidson Motor Trike, and kept local residents and workers on their toes. Doing so kept people from abusing the town’s myriad free parking spaces–some 12-hour, but mostly two-hour. With Taguma retired, that plan is no longer possible. And that has county officials thinking the time is right to come up with a new parking plan that more closely resembles those used by Mainland cities. Of course, parking meters have popped up before in county reports and MRA meetings. But with Taguma gone, there’s a new intensity in officials’ desire to act. The fear is that without Taguma ruthlessly ticketing people for leaving their cars in spaces for even a few minutes beyond two hours, finding a parking place in Wailuku Town will become even more difficult. There’s also the possibility about opening a new revenue stream (all those parking fines we paid because of Taguma went to the state, not the county). So county planners are thinking about a variety of new measures–including parking meters, which could come to Wailuku possibly as early as this summer. In October 2010, Progressive Urban Management Associates (PUMA) released its Wailuku Redevelopment Area Market-Based Plan. In it, paid parking plays a vital role in the continuing redevelopment of Wailuku Town. As part of their report, PUMA conducted a community survey of 1,011 residents’ views on paying for parking where it was once free. According to the report, “about half of survey respondents said they were willing to pay a nominal parking fee for short term parking use,” though the actual survey results included in the back of the report don’t exactly show that. The actual survey question began with the statement “I would be willing to pay a nominal fee (up to $1 per hour) to park closer to my destination.” Respondents were then asked whether they agree, strongly agree, disagree, strongly disagree or hold no opinion on the statement. The results show that 37 percent (which is closer to a third than “about half”) of those surveyed agreed or strongly agreed that they would pay a “nominal” parking fee, but 41.1 percent disagreed or strongly disagreed with paid parking in Wailuku Town (22 percent held no opinion). Three years later, the Wailuku Town Parking Study And Parking Management Plan Analysis, prepared by Andrew Miller of Michigan-based Downtown Parking & Planning Associates (which Wade said was updated this spring), consultants used Taguma (though without naming him) as a jumping off point for new meters. The 2013 report makes one point crystal clear. While the timing of implementation may vary, “our recommendations are based on the assumption that paid parking will be part of the final parking management solution,” the report states. Both the 2010 and 2013 reports also recommended converting the 12-hour spaces in the county’s Municipal Parking Lot to paid parking. “A nominal parking fee could help generate revenue to help pay for parking improvements and create more parking availability for short-term needs,” states the 2010 report. The 2013 report also made clear that the county must improve the Municipal Lot’s condition. Right now, the asphalt that covers the lot is pitted and deformed with about 37 million cracks. The study further calls for a lot of work to redo the lot entirely. “Considering the degree of physical deterioration, we believe the lot needs to be completely demolished and re-paved, to include removal of interior curbing and tree pits,” states the study. Last week I spoke with Andrew Miller, who wrote the 2013 study. He said he hasn’t been on Maui since 2011, and asked if any repairs had been done to the lot. I told him no. If you’re wondering why the county should fix up the Municipal Lot–the site of the proposed large parking garage that county officials have been talking up for the last decade–don’t worry. It hasn’t been well publicized, but that big garage plan–which even at one time included commercial development–is dead. Well, mostly dead. Though the 2013 report and Wade said the county is planning for paid parking on both Wailuku streets and the municipal lot, Miller said the current business climate meant that paid street parking may not be the best solution for Wailuku Town (though he reiterated that the municipal lot should not be free). That’s a lot of meters and a lot of income, and it’s not even taking into account the 33 parking spaces on Main Street in Wailuku because “it’s unclear at this time if the County can charge for parking on a state road.” The 2013 report also recommends hiring a “parking management firm” that would handle any pay lots. Good luck with that last part (the Maui County Council will ultimately decide what to do with any parking fees that come from Wailuku Town). In any case, Wade said that the parking fee figures in the report can still change. “We’ve been talking about not exceeding $.50 an hour,” she told me. Wade added that it’s also possible people who work in Wailuku Town may be able to apply for parking permits so they can avoid the fees. The same would go for people who live in residential areas that border the downtown area (places where workers sometimes park when nothing in town is open). One of the recommendations in the Wailuku Town Parking Study was that county officials form a “parking committee,” and Wade said that’s being done now. She also said the county Planning Department is preparing a Request for Proposals for another consultant on paid parking. Eventually, the goal is to prepare a proposed ordinance that would legalize paid parking in Wailuku Town for the County Council. Wade said that the council most likely wouldn’t be able to debate such a law until after the spring budget sessions are over, which means they’d likely take it up in the late summer or early fall. “But no solution has been written in stone,” said Wade.